North America Forum»Forum ›League of Angels ›Support › How do you use the Glory stones? How do you use the Glory stones? I\'ve searched and searched and searched, nothing. It says its in the Guardian Angel tab but I\'ve looked high and low and to no avail. It also says opens at level 57. I\'m level 63. Can anyone help please? Need to know how this works. Seems like GTArcade is making things harder and harder to find. having the same issue. for the life of me I can\'t figure it out. 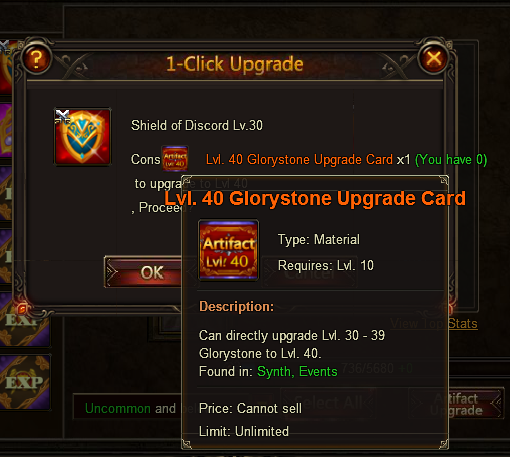 Well don\'t know what Glory stone is but i think its related to the artifact workshop? if yes, then u have to be lvl 70 to use that feature. For now u can save those and use when u r lvl 70.
ahh that, that really misleading name lolz. one side says crystal another says stone -_-. ;where did you find that? 2019-4-21 11:03 GMT+8 , Processed in 0.061777 second(s), 52 queries .